Spanish designer Jaime Hayón has turned a paulownia tree planted by Modernist architect Le Corbusier at his Villa Le Lac into a collection of wooden objects for Cassina. The range of three objects – a bird, a swing-shaped shelf, and a house – has been released by Italian brand Cassina to commemorate the 50th anniversary of the Modernist architect's death. 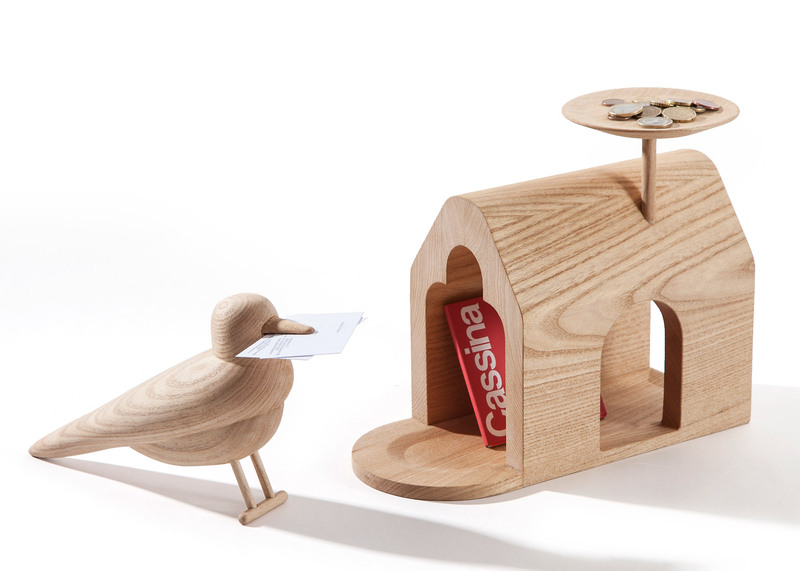 The bird functions as a letter holder, with a slit in its beak that can hold papers and another down its back that can be used to store postcards. Small objects can be placed in the birdhouse, which features a wooden peg for hanging keys and a coin tray that extends above the house like a chimney. The shelf mimics the shape of a playground swing. Its "seat" functions as storage space and hangs from leather cords that can be attached to the wall using a pair of wooden pegs. The wood used to construct each of the items was sourced from a paulownia tree in the garden terrace of Le Corbusier's 1924 Villa Le Lac, on the shores of Lake Geneva in Switzerland. "This particular tree, considered by many architects as the 'sacred tree' of the villa, was chosen by the architect himself," said the villa's curator Patrick Moser. After discovering it was suffering from an incurable illness and needed to be removed, Cassina helped to fell the tree and transfer it to its Meda carpentry workshop. The Hayón-designed pieces will be produced while wood is still available, and are sold as individually numbered and authenticated editions. "I was honoured to be given the task to create new objects from the Villa Le Lac tree to, in turn, honour the great Le Corbusier," said Hayón, who previously collaborated with Cassina on a furniture collection shaped to resemble the curved structural elements of the architect's iconic buildings. "I thought about who would most miss the beautiful paulownia standing on the banks of Lake Geneva. I thought about birds singing amidst the sound of leaves in the wind, a little home for those birds, and kids laughing joyously while swinging from the branches." "I let this spirit guide me in creating the three objects which speak the poetic nature of the tree, evoking new life," he added. French car manufacturer Renault has also commemorated Le Corbusier's anniversary with a concept car that loosely references the architect's penchant for raising sections of his structures on thin piloti.